Ald. 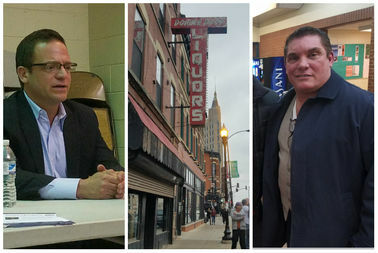 Joe Moreno (1st), Double Door and building owner Brian Strauss. WICKER PARK — The owner of the building that was long home to the famed Double Door club says Ald. Joe Moreno (1st) tried to intimidate him and that the lawmaker threatened to stop other tenants from coming into the prime spot as punishment for evicting the iconic music venue. "You are not going to get a dime out of this building. It's going to be an empty building with no income for you or your family. End of conversation," Moreno told Double Door's former landlord Brian Strauss in a conversation recorded in a cell phone video in late February that was broadcast by CBS2 on Tuesday. "You can come back to me on your knees, which is gonna happen," Moreno said as he stood on the sidewalk in front of the building, 1572 N. Milwaukee Ave.
"[Moreno's] screaming obscenities," Strauss told CBS2. The incident also sparked an investigation by independent watchdog group Project Six led by former city inspector general Faisal Khan. Reached late Tuesday, Moreno said that he showed up at the former Double Door on the day employees were removing their possessions "to see if [Strauss] would give them more time to move out and be reasonable." Moreno said he does not regret having had the conversation caught on the video. Moreno told DNAinfo that Strauss is "a dishonest man and irresponsible landlord." "He tries to bully everyone and unfortunately, you have to take on a bully by being a bully," Moreno said. A real estate source says that Target is among the retailers interested in the prime location near the busy intersection of Milwaukee and Damen avenues and that Strauss is trying to finalize a deal to sell the 113-year-old building to a private developer. Strauss denied that Target is interested in the building, and said that "several prospective tenants" have looked at the property and he is also talking with folks who want to buy the entire building. "I have gone to many Wicker Park Bucktown Chamber of Commerce events and community meetings and I am talking with different business owners in the neighborhood about what would be a good fit. I've been doing my due diligence and taking time with this," Strauss said. In April of 2016 — after six months into what would be 18 months of eviction hearings and when the Double Door space was listed for rent — Moreno initiated a zoning change that shrinks options for future tenants. Moreno's requested zoning change would restrict the four-story Double Door building to a zoning classification designed for low-traffic streets — unusual for a busy intersection like Milwaukee and Damen. Moreno's proposal to rezone the building was tabled last June by the city's Committee on Zoning, Landmarks and Building Standards, city records show. No further action had been taken on the rezoning in almost a year, and Strauss previously told DNAinfo that he believes the Moreno's zoning change proposal was used as a threat. The proposal, if approved by the full City Council, would mean that new commercial or retail renters wanting to make a change, such as adding a bar, would need to go through a lengthy approval process with the city, community and Moreno. Real estate developers who've been touring the former Double Door over the past month say they've signed non-disclosure confidentiality agreements preventing them from discussing any possible deals. Sean Mulroney, co-owner of Double Door, told CBS2 that the club no longer has "skin in the game" with the building. "We are excited about the prospect of reopening in a space with a landlord that appreciates being paid on time and without issue. We were grateful for the attention of Alderman Moreno and worked closely with him to be a part of Wicker Park, just as we did with his predecessor Alderman Many Flores," Mulroney told CBS2. Through a spokeswoman on Tuesday, Mulroney had no comment on the club's planned relocation to a former bank building at 2551 N. Milwaukee Ave. in Logan Square. Metro and smartbar founder/owner and Double Door co-owner Joe Shanahan, said on Tuesday that he and Mulroney "explored all avenues to keep Double Door in its home of 24 years, continue to employ over 40 staff members, and provide a stage for hundreds of bands, promoters and DJs." Shanahan described Strauss as "Ill-advised and stubborn." "To our great disappointment, Strauss has a differing vision for the building—a vision that has left a bastion of Chicago’s arts community vacant, Double Door staffers jobless, and countless musicians and cultural events without a home. We deserved better. Our patrons deserved better. The city of Chicago deserved better," Shanahan wrote in a statement. For 18 months, Mulroney and his lawyer battled Strauss in court over whether the club had given enough notice that they wanted to renew the venue's lease. Ultimately, Double Door lost the battle and were evicted by the Cook County Sheriff on Feb. 6, 2017. Since 1977, Strauss' family has owned the unique building, which has a door at 1570-72 N. Milwaukee Ave. and another at 1551-59 N. Damen Ave., giving it its name Double Door.